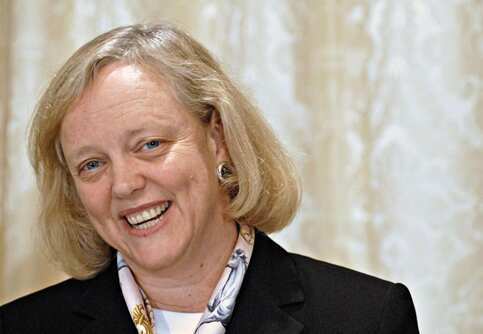 Meg Whitman, president HP. Photo by Bloomberg. New York: Hewlett-Packard (HP) on Thursday named former eBay chief Meg Whitman its new president and chief executive officer (CEO), replacing Leo Apotheker at the helm of the world’s biggest computer maker. Whitman, 55, stepped down in 2008 at eBay, the Internet auction giant, and last year made an unsuccessful run to replace Arnold Schwarzenegger as California governor, losing to Democratic veteran Jerry Brown. Among the changes at HP, Ray Lane has moved from non-executive chairman to executive chairman of the board of directors, and the board intends to appoint a lead independent director, a company statement said. “These leadership appointments are effective immediately and follow the decision that Leo Apotheker step down as president and chief executive officer and resign as a director of the company," the California group said. In the statement Whitman said, “I am honored and excited to lead HP. I believe HP matters - it matters to Silicon Valley, California, the country and the world." The shakeup comes with HP struggling for direction despite its leadership in the personal computer (PC) business. Katy Huberty, an analyst at Morgan Stanley, said the change was “a step towards regaining credibility with investors" but warned that “the path to a full recovery of investors’ faith in management and the company’s earnings power will take several quarters, if not longer." Huberty said HP still faces “formidable challenges" as consumers shift away from PCs. She said Whitman “brings strong technology industry relationships and leadership experience at a fast growing technology company but will need to prove to investors that she can make similar smart strategic decisions while running a much larger, more complex business" than at eBay. Apotheker, a veteran of German business software giant SAP, took over HP in November and has been refocusing the company on software and cloud services - offering applications and storing data services over the Internet. But HP shares have fallen more than 40% since Apotheker replaced Mark Hurd, who resigned following a sexual harassment accusation. HP shares plunged 20% on a single day last month after Apotheker announced a dramatic strategic shakeup at the world’s top personal computer maker that includes spinning off its PC business. HP announced on 18 August it was exploring a spin-off of its PC unit and buying British enterprise software company Autonomy for $10.24 billion as it refocuses on software and technology solutions. In a further move away from the consumer space, HP said that it was stopping production of its TouchPad tablet computer, its rival to Apple’s iPad, and phones based on the webOS mobile operating system acquired from Palm last year for $1.2 billion. HP began laying off employees in its webOS unit on Tuesday. Analyst Rob Enderle of Enderle Group in Silicon Valley said a key to the shakeup is that Ray Lane will be “a chairman with authority." Lane “is the guy running HP but doesn’t want to do it full time so he brought in a more traditional CEO. Now, we have a CEO who is in effect a subordinate to the chairman. “Whitman can take orders. With a strong leader on top of her I actually think this might be able to work," said Enderle.